One of the things that has often bothered me about gay cinema is that all too frequently they end in tragedy. There is usually a gay bashing, everyone turns against them and they have to conduct their love affair in secret, one is usually more open than the other, and in the end one of the pair is usually killed by homophobes. In doing so, these films make themselves completely about the couple's sexuality, and when that's all they're about, they marginalize themselves. Sometimes these stories are legitimate stories with legitimate things to say about homosexual love in our society. Brokeback Mountain is a shining example of that. But in films like Watercolors and Dream Boy, the film becomes solely about the characters' sexuality, and misses out on the essential quality of their love - that it is just love. Love is universal, whether it is heterosexual or homosexual, and these niche films often overlook that simple fact. You don't see love stories about straight couples dwelling on their heterosexuality. Thankfully, I think we are finally moving into what some are calling a "post-gay" period, in which a person's sexuality is not seen as their defining characteristic, and as such homosexuality is now being increasingly accepted as a normal part of life. And it seems that our films are beginning to reflect that as well. 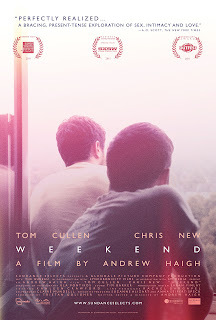 Tom Cullen as “Russel” and Chris New as “Glen” in WEEKEND, directed by Andrew Haigh. Photo by Quinnford & Scout. © Glendale Picture Company. A Sundance Selects release. Andrew Haigh's Weekend is perhaps the first "post-gay" film. Its protagonists are homosexual, but Haigh treats their sexuality as beside the point. They are simply two people who forge a connection, and in this case, that's all that matters. Russel (Tom Cullen), is a rather shy young man, who after a party at a friend's house, decides to stop by a gay bar on his way home. There he picks up Glen (Chris New), a young artist with some uniqueviews on love and relationships. But what should have been a one night stand turns into something more, as the two share a spark that neither one of them could have expected. Their relationship takes on a new urgency, however, when Glen reveals that he is moving to America for two years at the end of the weekend, giving them just two days together. While Glen dismisses the idea of romance, Russel realizes he may have found and lost his soul mate in one whirlwind weekend he will never forget. Part of what makes Weekend so remarkable is that you could easily replace the gay couple with a straight couple and it would work just as well. It's not a film about politics. And while politics is certainly one of the topics discussed by Russel and Glen, it's not the centerpiece of the film at all. Weekend is a film about fleeting love and brief connections, where two people forge an unforgettable bond that will resonate for the rest of their lives. Haigh directs with a strikingly naturalistic eye, giving the film the feel of an actual relationship lived and developed in real time. It's reminiscent of Richard Linklater's Before Sunrise, and while I wouldn't go so far as to say it's as good as that film, there's definitely something special at work here. Its seeming aimlessness makes it that much more real, deftly avoiding romantic cliches and sentimentality, thereby creating something infinitely more beautiful and moving. Haigh has no interest in fairy tale endings or cutesy "Notting Hill" moments as Glen calls them, he's a realist. But there's a certain tremulous beauty in his unsentimental frankness. It's romance without pandering, and that's a refreshing development for any love story, gay or straight. One hopes that Weekend is a harbinger of films to come - real stories about the real gay experience, not a continued dwelling on oppression and repression. And while it may seem counterproductive to make such a big deal over a film for whom sexuality is no big deal, it's a development in gay cinema that has been a long time coming. "It gets better" we continually tell the young victims of anti-gay bullying, but our films continue to reflect tragedy, and as a result, hopelessness. We're here, we lead normal lives, and it's high time cinema catch up with us. In fact, labeling Weekend "gay cinema" at all is almost a misnomer, since it is not a film about sexuality but a film about love, no matter the form. I want to see more films like this. And with talented young filmmakers like Haigh creating fresh, honest films about gay relationships that aren't sensationalistic or reductive, the future seems especially bright. WEEKEND | Directed by Andrew Haigh | Stars Tom Cullen, Chris New | Not rated | Now playing in select cities. I couldn't have put it better. I've seen it twice now since it opened here, because it is such a breath of fresh air on the otherwise cliche gay cinema of the last decade.